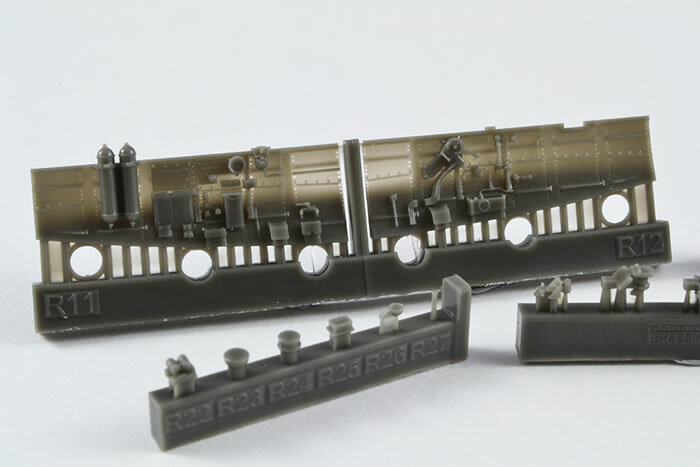 23 grey resin parts, 23 photoetched parts, an acetate film and comprehensive instructions. 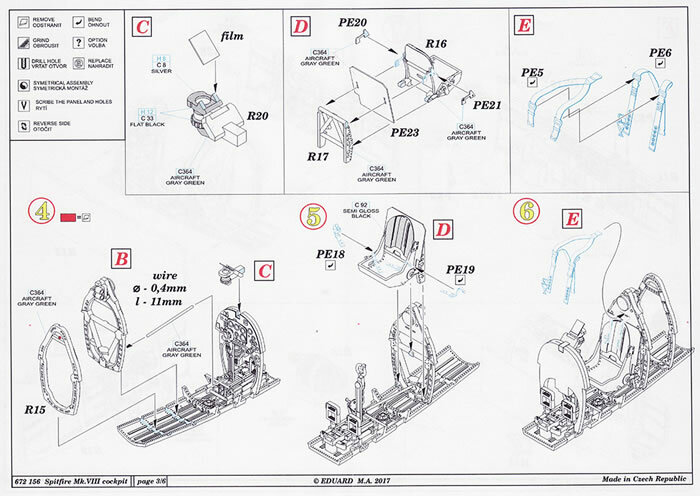 Superbly detailed; Eduard’s usual high quality instructions. 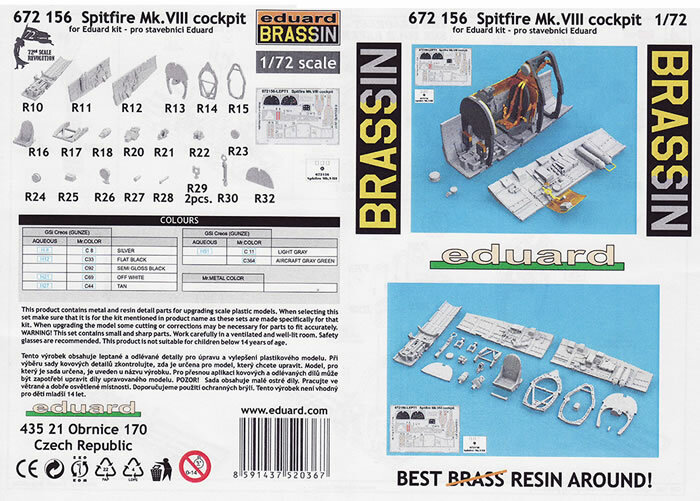 If you want to take your Eduard Spitfire VIII to the next level, then this is the set for you. This set comes in a strong and protective box, with copious amounts of sponge foam protecting the fragile resin parts. The 23 grey resin parts exhibit an amazing degree of detail at such a small size. May I say as a Spitfire aficionado who generally builds in 1/48 and has a number of the Brassin sets, cockpit, engines etc and been amazed at the level of detail in that scale, was really blown away that the detail on the majority of these 1/72 parts is identical to the 1/48 version but just way smaller. Eduard, you continue to do incredible things with resin. 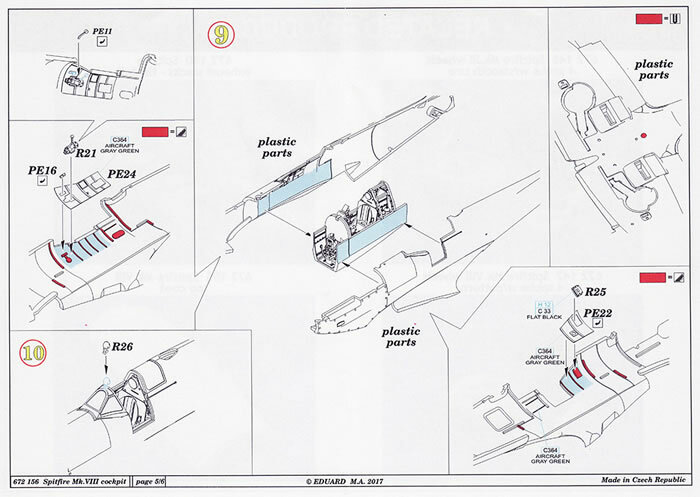 The side walls have great detail but at the same time, are thin to enable their fitment within the fuselage without major work. 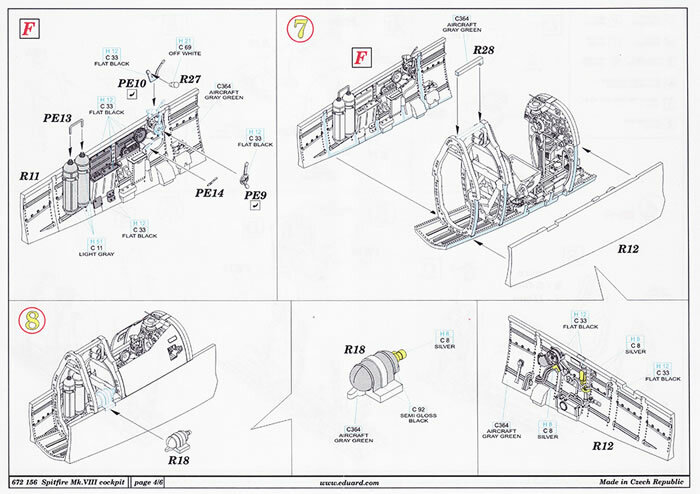 Eduard has excelled with the fineness and level of detail with the cockpit floor. 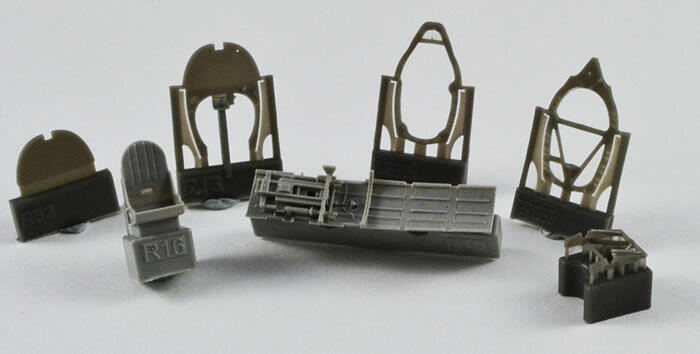 The mainframes come with good support from the casting process to ensure you get them on one piece. They have good detail of lightening holes etc. 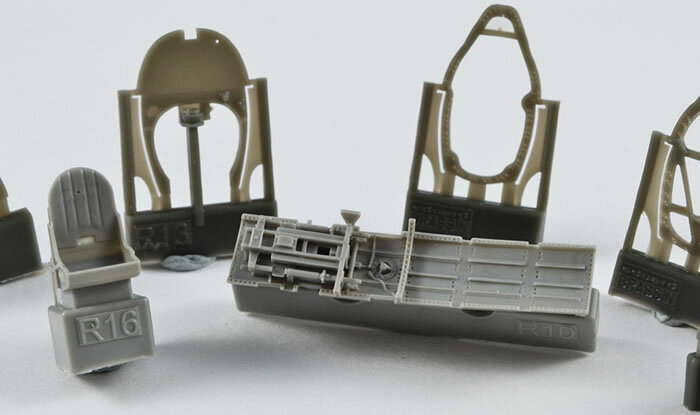 There are a number of smaller pieces including the control column, gun sight, rudder pedals, gas bottles and many other small boxes etc, all moulded with excellent detail. When constructed they will give a really good sense of full 3D-ness within the cockpit. A comprehensive etch sheet is supplied with the usual pre-painted multi-piece instrument panel and coloured Sutton seat belts. 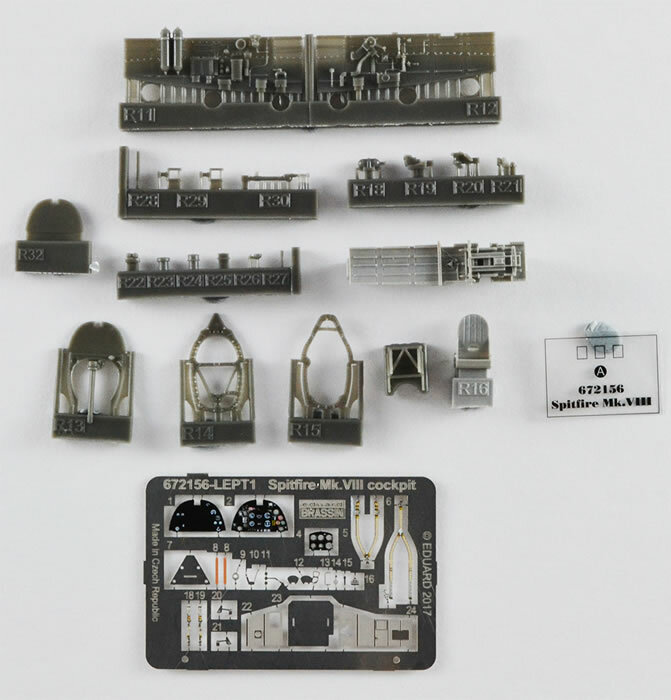 The plain pieces consist of the inner upper side panels, with you having to remove moulded in detail before adding, as well as armour panels for the pilots seat and headrest, and a number of levers and handles for various instruments. The challenge with this kit, and yes, it is a kit in its own right, is in the detail painting to bring the detail Eduard has supplied for us to the fore. 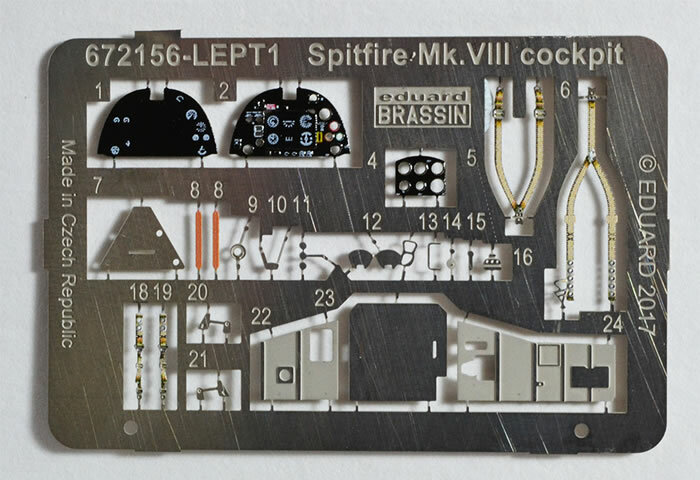 Well, the damning conclusion is that I’m going to have to go and purchase a Spitfire Mk VIII kit so that I can use this gem of a detailing kit. 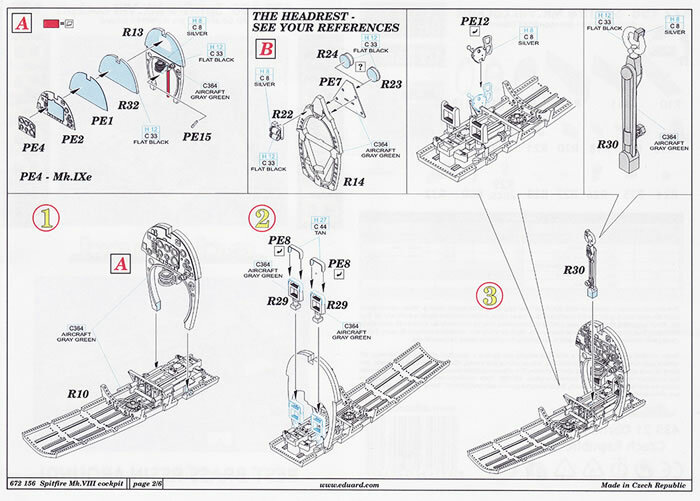 And if you are looking to really lift the level of detail in your Spitfire cockpit, then look no further as this is what you will need.